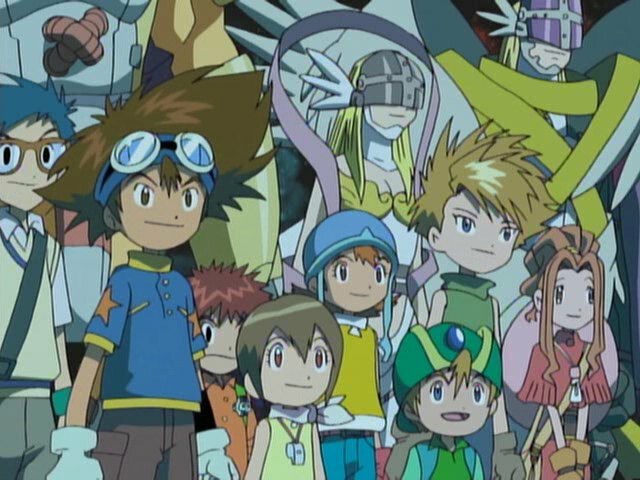 The finale for Digimon Adventure is unlike any of the other finales in that there's very little story involved. Usually, most of the time is spent wrapping up the final battle, with minimal time left to cover the falling action. This series ends with a victory lap, then a chance to say goodbye to each character in turn. It's appreciated. They finish off Apocalymon quickly. It's almost like he was never a threat to begin with. Everybody gets their chance to shine, mostly to free up Matt and Tai to charge in and finish the job. Even when Apocalymon uses a self-destructive attack that threatens to blow the whole world up, the kids don't panic and their digivices contain it. Andromon and Ogremon join the victory celebration, and the families look up with pride. It's Miller Time! After some cute nonsense at Primary Village, the kids and their Digimon find themselves by the lake where episode three took place. Able to relax for once, they start doing some math and thinking about how long they can stick around until summer's over. Somehow they're excited at the prospect of staying 110 years, despite not being able to see their families or friends in that time (and having to immediately head back to school... talk about forgetting stuff over summer break). Gennai appears out of nowhere to deliver the bad news: time in each world is now synchronized and in two hours the gateway home will close forever. I'll ignore the fact that they never explain why time is now synchronized, or why they need to rely on that gateway when they can just use those keycards once that part of the world regenerates. Point is, the kids suddenly realize that they have to say goodbye to their Digimon. Given how long they've been together, two hours doesn't seem like a lot of time. What's beautiful about the way this ends is how everybody gets their own moment to say goodbye in their own way. Sora talks about how having a partner to take care of helps her understand her mother more (a much better reflection than the one we got last episode). Joe and Gomamon share a couple laughs and settle on a firm handshake. Izzy stuns Tentomon by actually being emotional for once. TK and Patamon have a good cry until they realize it's not achieving anything (Patamon insists they'll meet again anyway). Matt and Gabumon pretty much got all their feelings out in the cave and don't have much to say. Gabumon just wants to hear the harmonica again... which gets Tai all pissed because it's making him all weepy when he just wants to goof around with Agumon one more time. Kari gives Gatomon her whistle, a sign that she's a little less helpless now. She's even more confident than Patamon that there will be a next time... which kinda gets into Creepy Kari territory again. 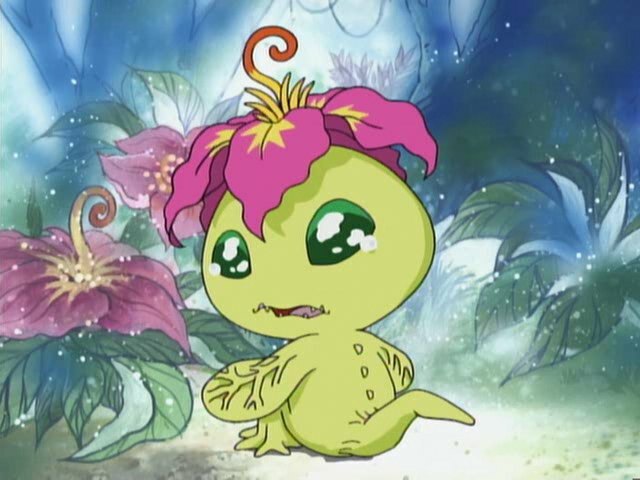 As for Mimi, Palmon is nowhere to be found. It's a sad final note for her, and strangely appropriate. Palmon has always been the most patient and least intrusive, not really commenting on Mimi's choices even when she disagrees. It's easy to see her so firmly attached to Mimi that she just can't let go. Breaks Mimi's heart, and everyone else's as they plead for more time to give her a proper goodbye. No dice. She's too distraught to look out the window as the trolley takes off. Palmon, of course, comes around and her voice draws Mimi to the window. They say goodbye from a distance, Mimi's hat flying off and fluttering around, one last reminder of their presence in the world. The whole sequence is one of the best in the series, particularly in that it doesn't show the kids returning home. It doesn't need to. All we see is the crossing gates from episode 12 flash, then raise. The train has passed. All is clear. It's amusing the lengths the animators go to be able to re-use stock footage of Lillymon and Garudamon attacking, despite them carrying Mimi and Sora. Sora has to hitch a ride with MegaKabuterimon. Lillymon flings Mimi into the air, fires her attack and then catches her. If the Digital World needs to be completely rebuilt after being corrupted into Spiral Mountain, where exactly were Andromon, Ogremon, Centarumon and Gennai after the mountain was deleted? The first Japanese ending, I Wish, shows the seven kids and their partners against a city skyline, despite the first half of the show taking place entirely in the Digital World. That skyline animation appears to be reused here when showing Digimon leaving the real world after Apocalymon's defeat. Agumon points out a spot by the lake where he first used his Pepper Breath attack. Um... wouldn't that have been on the cliff during that first fight against Kuwagamon? While “Hey Digimon” has always been a questionable choice for action sequence music, it's absolutely appropriate and almost perfect for the parting shot of the kids waving goodbye. You know what's even more perfect? Butterfly! Good to see someone doing episode summaries for the series. Recently those of us in Australia were fortunate enough to have Digimon Adventures released to us on DVD through Madman Entertainment - was really good getting to go back through all the episodes we grew up watching. "I'll ignore the fact that they never explain why time is now synchronized--"
Actually, I think this was explained, at least in the original. The Digital and Real Worlds used to share synchronised time, but Digital World's time was thrown off the rails when Apocalymon appeared. With Apocalymon dealt with, time between the worlds is synchronised again and stays what way, as we see in Adventure 02. A great review once again. You were spot on, especially about what made this season ender different from all the others - the emotional and appropriately long good-bye scenes. I hope going through Adventure hasn't completely drained your energy and you'll keep going on with your plans to review every season. These reviews are always a pleasant read and I'd sure like to see every season thoroughly analysed. PS: I always thought it made perfect sense for Sora to get the hell away from Garudamon when she was firing Shadow Wing. I imagine it would be a messy end for Sora if she stayed on Garudamon's back when the giant bird covered herself in fiery energy, unless the girl became heat-proof at some point. Kacku already made the two comments I wanted to make (time and Sora getting charred) so I'll just say "I agree." That being said, I love these reviews as well--might go back and make some comments on a few of them I've read when I get a chance. A few weeks ago I went back and watched Digimon Adventure all the way through for the first time in years, so seeing these reviews going on around the same time was great serendipity. Please keep it up! Can't wait to read more. But of course. TV Tropes refers to a "Sorting Algorithm of Evil", but it apparently applies to the good guys as well in this series. Zudomon was the last Ultimate to debut aside from the two angels, and Ikkakumon was the last Champion to debut aside from Angemon. So it's really no surprise that at just about any stage, Gomamon was second only to Patamon in capability (except for Rookie, where he was largely situational but ultimately was probably second to Palmon in utility). Yes, I'd even put Zudomon ahead of Angewomon. The bit where she took out Myotismon's first form was nice, but debut appearances always result in a victory (well, almost always--Garudamon had the misfortune of debuting against a major villain who was also making his debut) and her only really meaningful victory beyond that was against LadyDevimon. Zudomon was instrumental in taking out a Mega--SaberLeomon may have struck the final blow against MetalEtemon, but he wouldn't have been able to pierce MetalEtemon's armor without Zudomon's help. Again, this puts Zudomon in territory pretty much only reached by Patamon's digivolutions. How many times in this season has a Digidestined's Digimon taken out a higher-level Digimon? There was Angemon beating Phantomon, Zudomon essentially beating MetalEtemon, and MagnaAngemon beating Piedmon (although technically the two Megas struck the final blow), and...well, right after Myotismon's defeat (before he returned as VenomMyotismon) we saw the Bakemon army reduced to such cannon fodder that the rookies were all able to take them 1v1. The rookies banded together to take out Champions on other occasions--Kuwagamon in the first episode and Shellmon right after they returned to the Digital World--but the Bakemon are the only ones I remember going down to a single attack from a single rookie. That's an interesting point, but that comparison suggests some kind of elemental compatibility was involved too. Angemon, Angewomon, and MagnaAngemon all have a rock-paper-scissors advantage over dark Digimon like Phantomon, Myotismon, and Piedmon, since the second season showed they had no special advantage over other types. You see something like that with Zudomon, as his Vulcan's Hammer attack could crack MetalEtemon's armour, but not Puppetmon's mallet (which also repelled WarGreymon's metal gauntlets before it was easily crushed by Garudamon's claws).